Almost 13 years ago I had this dessert on the menu at The Local, where I was the pastry chef. It was hands down the most popular thing we ever made. Perhaps its success is due to the blend of the comforting banana bread and decadent chocolate ganache, all baked together in a warm pudding. Then I served it with roasted banana ice cream, which takes it to new heights, but I also love it with a bittersweet chocolate ice cream. Try both and decide. Last night I needed something to bring to an Oscar party. I love the Awards and all the pageantry that goes with it. Watching the show is an annual event with two of my closest friends and my step mother. We sit on the couch in our pajamas and critique the outfits on the red carpet. The evening is the perfect blend of our ultra-casual-comfort while we watch the over-the-top formal event. 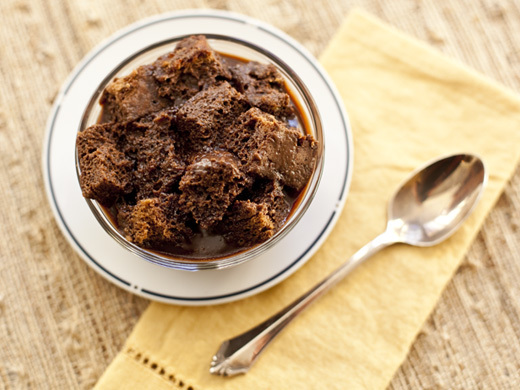 This chocolate banana bread pudding just seemed to match the contrast; elegant comfort food. In a medium sized sauce pan bring the cream to a simmer. Turn off the heat and add the chocolate. Swirl the pot gently so the chocolate is completely covered by the cream, cover the pot and let sit for 3 minutes. 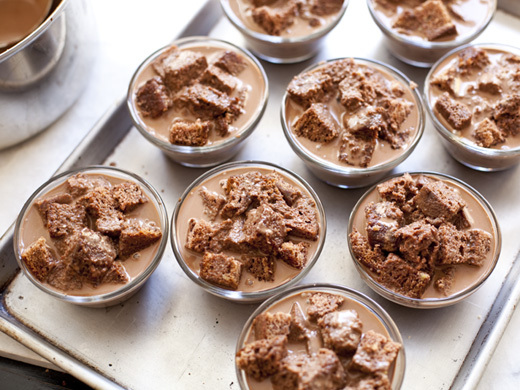 Whisk the cream and chocolate together until smooth. Add the half and half, brown sugar, rum and vanilla. In a separate bowl whisk together the eggs and yolks. 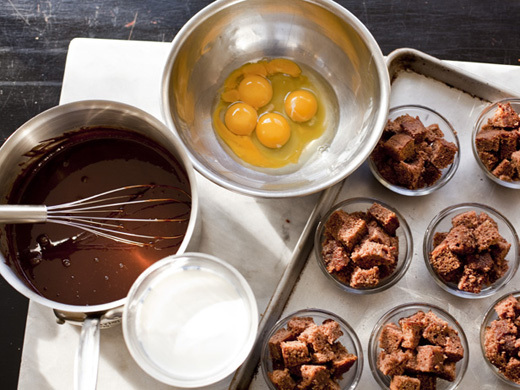 Add the eggs to the chocolate mixture and mix until combined. Place the ramekins on a cookie sheet, then slowly ladle the chocolate mixture over the banana bread. 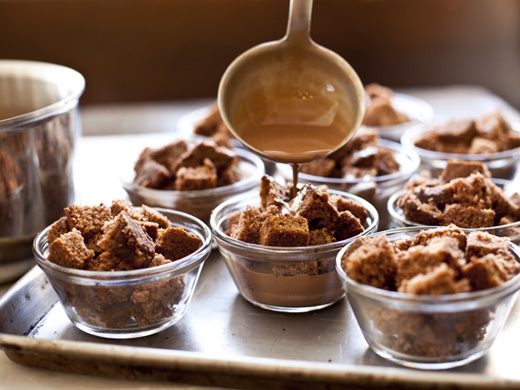 You will want to gently push the cubes into the chocolate, so that the chocolate will be absorbed by the bread. Fill the ramekins nearly to the top. Bake for about 45 minutes, or until the chocolate is set firm on the edges, but the center is still a little soft. Remove from the oven and allow to sit for 15 minutes before serving. They can be served at room temperature or chilled. You can also reheat them for about 30 seconds in the microwave or 10 minutes in a 350 degree oven. 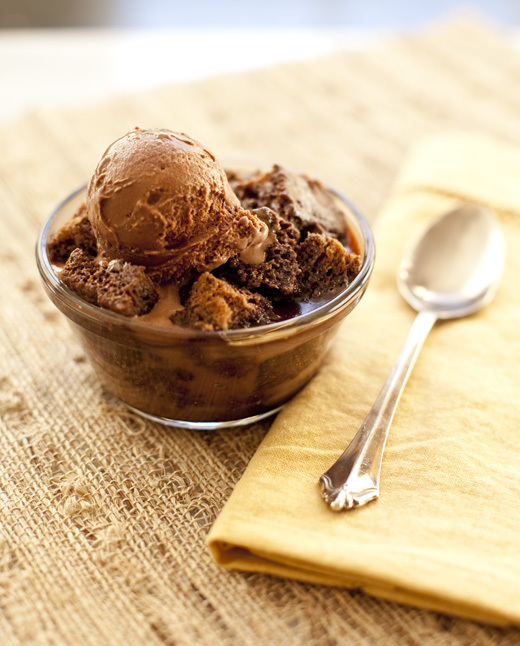 Serve with Roasted Banana or Bittersweet chocolate Ice Cream. WordPress doesn’t seem to offer that yet. The best thing to do is copy the post and put it into a word document, then you can print only the parts you want. I don’t really care for bread pudding, but this one sounds incredible! great pictures too – which makes it all look so easy! This looks incredible. I love bananas and chocolate together! And roasted banana ice cream? Yes please. O MY this looks scrumptious. I just happen to have a banana bread in the freezer. I think I just found it a home!! My parents love bread pudding. This recipe sounds amazing. Definitely will make this next time they come in town. If I wanted to bake it in a single dish (not having 10 individual ramekins), do you have a size recommendation? Thanks! You can try it in a 9-inch square and see if it fits? I would just put the cubed banana bread in the pan and see if it is going to work, before you pour the custard over it. If the bread won’t fit, you’ll have to graduate to something slightly larger. What is half and half? We don’t have that in our country. Half and half is a mixture of milk and heavy cream. We use it in our coffee. You can make your own by blending milk and cream in equal parts. To avoid alcohol, would you just omit the rum or could you suggest a substitution? Thanks!! You can use a touch of vanilla instead or just omit the rum. 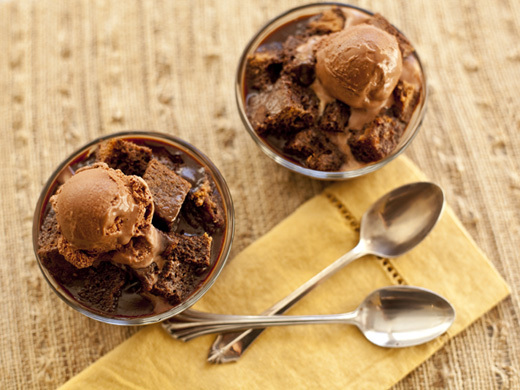 If you like the flavor of coffee, it would be a nice contrast in this dessert.